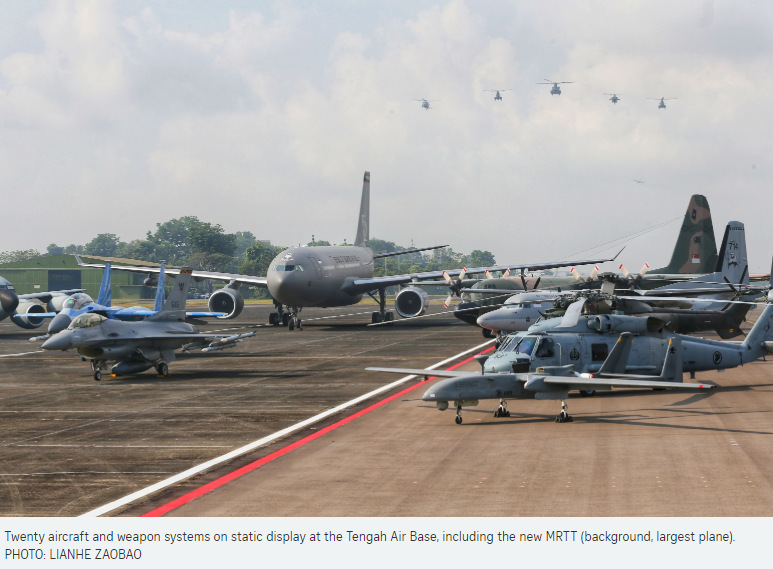 The Republic of Singapore Air Force (RSAF) marked its 50th anniversary at Tengah Air Base yesterday with a parade of 480 personnel, a flypast and a display of 20 aircraft and weapon systems, including its latest aircraft acquisition. 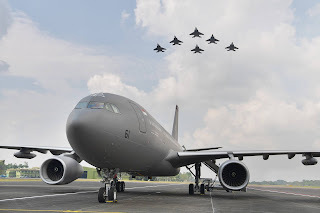 Making its first appearance was the new, next-generation Airbus A330 Multi-role Tanker Transport, an aerial refuelling tanker aircraft that will replace the KC-135R, which has been in service for more than 20 years. Prime Minister Lee Hsien Loong officiated at the parade, which draws the curtain on the RSAF's year-long golden jubilee celebrations. The event was also attended by about 1,400 guests, including Defence Minister Ng Eng Hen, Chief of Defence Force Lieutenant-General Melvyn Ong, Chief of Air Force Major-General Mervyn Tan, six former chiefs of air force including labour chief Ng Chee Meng, as well as Asean air force chiefs and former air force servicemen. PM Lee said the RSAF began its early steps in a hurry. The Singapore Air Defence Command (SADC) was set up on Sept 1, 1968, with great urgency after the British government announced that it could no longer afford to maintain a military presence East of Suez, and so was accelerating the withdrawal of its forces from Singapore. "We needed to create an air force quickly. Singapore was and still is a small country with no strategic depth. We have no room to fall back, to trade space for time, or to regroup in the event of an attack," he added. But what the RSAF pioneers lacked in resources and manpower, they more than made up for with their passion and determination by going for overseas training, pulling long shifts and pitching in to do daily maintenance tasks such as painting runway markings by hand, said PM Lee. Their work helped the SADC become a credible force by 1971, and it was established as one of three services in the Singapore Armed Forces. It was renamed the Republic of Singapore Air Force in 1975. Describing the RSAF today as "a professional, well-trained and well-equipped air force", PM Lee said it is continuing an unending task to ensure its equipment, technology and systems are up to date. But a first-class air force is not just about the latest technology and equipment, he said, adding that it is equally, if not more, important that the RSAF upholds discipline, team work and commitment, core values that pioneer officers embodied and passed on. "The RSAF must continue to attract men and women with the right heart and spirit. Serving in it requires a deep sense of commitment to the nation," he added. PM Lee said that during the Trump-Kim summit in June here, the RSAF showed the world it was operationally ready, when it was tasked to defend Singapore's skies by forming a protective dome. Despite having only two weeks to prepare, with many having to cancel leave plans, "you stepped up to the challenge, and showed Singapore and the world your capabilities and dedication", he added. RSAF chief Tan, in his speech, paid tribute to the pioneers and servicemen who had lost their lives in the line of duty. "Because of their sacrifices and the successes of the men and women who came before us, the RSAF today can welcome the future from a position of strength, and with confidence and optimism for even greater things to come," he said. The new Airbus A330 Multi-role Tanker Transport (MRTT) is capable of conducting air-to-air refuelling and airlift roles at the same time. Compared to the KC-135R tanker it replaces, the MRTT has better endurance, cargo and passenger capacity. It can carry up to 37 tonnes of cargo or 266 personnel. It can also carry 111 tonnes of fuel, which can be used to refuel both drogue-refuelled and boom-refuelled aircraft. Its aerial refuelling boom system is operated by fly-by-wire controls and electrical actuators, together with a three-dimensional video system. The video system provides operators with a clearer visualisation of ongoing refuelling operations. The MRTT has a cruise speed of Mach 0.86 (1,062kmh) and a wing span of 60.3m. 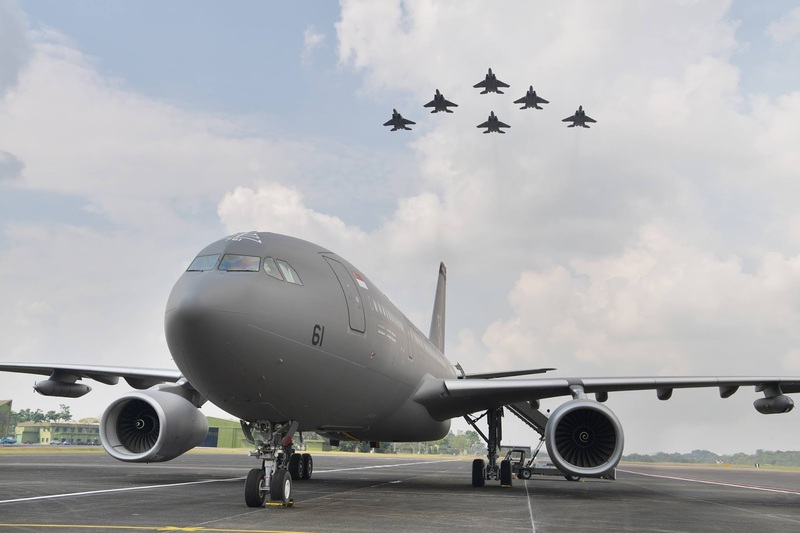 Other than extending the flying time of fighter aircraft, the MRTT will also enhance the Republic of Singapore Air Force's ability to contribute to international humanitarian assistance and disaster relief missions, and peace support operations. When required, the aircraft can also be fitted with medical equipment for aeromedical evacuation missions. The KC-135R aerial tankers the MRTT replaces were acquired second-hand from the United States Air Force in 1997.